Left: delicate sea lace growing epiphytically on Prionitis sp. Right: closeup of delicate sea lace branches. Image courtesy of Sandra Lindstrom. Collection number SCL 15351 in the UBC Herbarium Algae Database; search the specimen in the database for more information, or search the species for more occurrences. 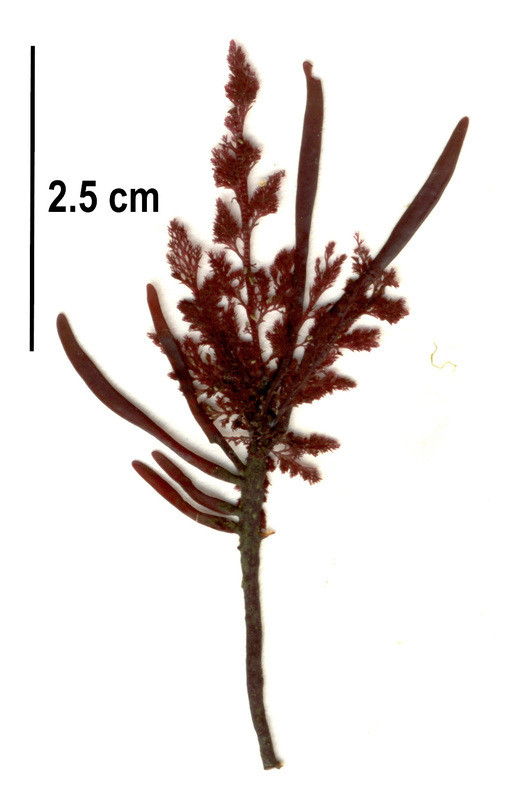 Delicate sea lace is a highly-branched red alga with inwardly-curved branch tips that resemble crab claws (forcipate branch tips). It has multiple orders of alternating branches, giving the seaweed a fairly symmetrical appearance. While delicate sea lace generally grows to lengths of 10-20 cm, it can reach up to 40 cm long. See the AlgaeBase species page for more photos. Delicate sea lace grows on rocks and epiphytically on other seaweeds. Common hosts for this species include Mazaella spp., Chondracanthus spp., Prionitis sternbergii, and Grateloupia americana. It is generally found in the lower intertidal of semi-exposed shorelines. Its range extends from northern BC to northern Mexico. Coarse sea lace (Microcladia borealis) is also highly-branched with forcipate branch tips. It can be distinguished by its branching pattern, however, which is only alternate along the main axis: further orders, of which there are 5 or 6, are pectinate (comb-like). It is also less commonly found growing epiphytically. Hairy pottery seaweed (Ceramium pacificum) also has forcipate branch tips. Holmes, J. (2007). Microcladia coulteri (Delicate sea lace). Beach Watchers. Washington State University. Accessed 15/06/2015.